– Train departs at 11:00 am ; meet on outdoor deck at 9:00 am for carpools. We are returning to the Cass Scenic Railroad as a daylight activity on Sunday. Cass Railroad tickets are for the 2 hour round trip to Whitaker Station, which recreates part of the logging tradition of the area. Definitely a family activity, for any weather. We will provide snacks for our group. Lunch will be on your own, either at the lunchroom in Cass or somewhere else of you choosing (suggestions to be provided). Those with SKMC Sunday meals who return immediately will have late sandwiches available. If you haven’t been there before, the Green Bank Telescope Science Center should be open in the afternoon, with public tours on the hour. Bob Bunge wrote in 2010: “Cass is unique and very much a treasure of mountain history and culture (much like SKMC). It has the largest operating fleet of geared locomotives in the US. 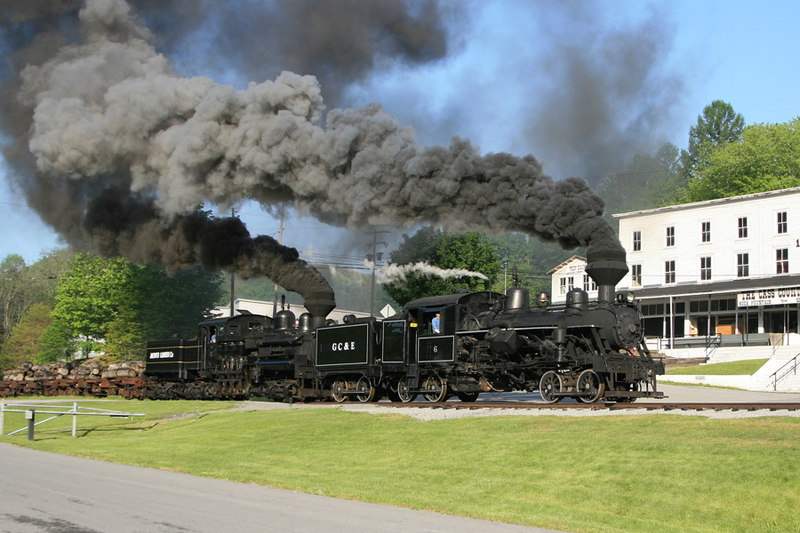 One of their locomotives, Western Maryland #6 is the largest Shay type locomotive ever made. Volunteer carpools will meet on Sunday morning on the deck after breakfast. Those who wish to be at Cass for the Locomotive Shop Tour should leave SKMC by 8:15 for a 9:30 arrival. The 10:00 Shop Tour leaves from the Visitor center, but be careful to get basck to the train before 11:00! Details of the free tours around the town of Cass can be found on the Cass State Park web site. Those who are going for the train ride only should be prepared to leave SKMC by 9:00 for 10:30 arrival. Leaving in between will give you some time to explore the town around the Cass depot. If you join a carpool, plan ahead for what you will do after the train and what you will do for lunch. You might want to get a box lunch in Cass at The Last Run restaurant (“the best place in town”) before you leave. There should be no problem getting back to SKMC for dinner, programs, and observing.